What is it about a French woman that is just so effortlessly perfect? I've read many books and blog posts and how-tos and it still remains a mystery to me. I've decided it must be something in the water. But I always enjoy adding elements to my life that will give me a little of that "je ne sais quoi." 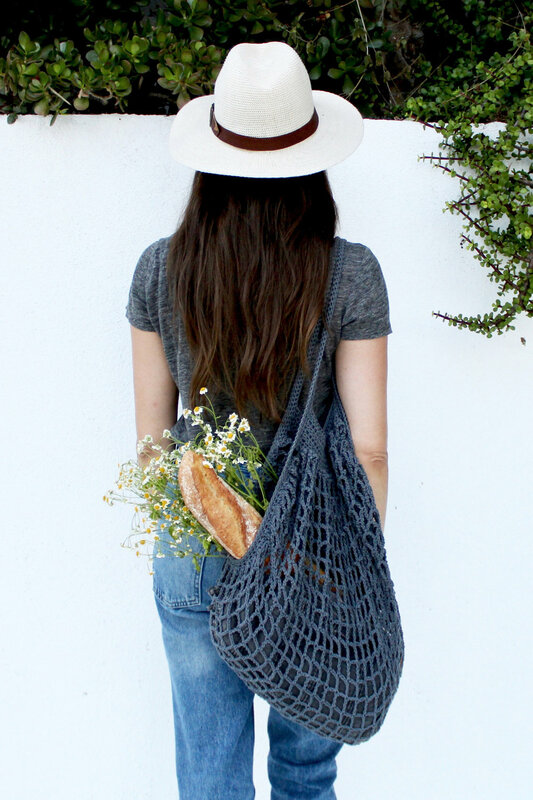 And my latest obsession is this simple but oh-so-chic market bag inspired by the traditional French net grocery bag. Continue on to the free pattern, or purchase a printable, ad-free version here. You can also purchase a kit containing all the yarn you'll need directly from Lion Brand here. This bag just screams to be filled with beautiful things and simple but elegant ingredients - flowers, beach essentials, leafy greens, wedges of fancy cheese, and loaves of bread ... lots of loaves of bread. Seriously, the last time I was in Paris I saw beautiful women everywhere walking around with baguettes protruding from their bags. I want to be one of those women. This bag came together thanks to my ongoing collaboration with Lion Brand Yarn. I worked it up in my favorite color (charcoal) of their 24/7 Cotton, which I've been obsessed with ever since I used it for my Movie Night Cocoon Cardi and Coffee Shop Wrap. I've seen tons of mesh market bags like this designed by other makers, but almost all of them are worked in the round from the bottom up, and most of them have a solid bottom before the mesh starts on the side. I actually designed a knitted version a few years ago called the Farmers' Market Tote in that style. But after studying one of the original French market bags I realized that they are not actually made in the round but rather in a large square that is then gathered quite closely on the two sides where the handles go and a little less on the other two sides to form the sack shape. This allows for optimum expansion of the bag. Although the stitch work is simple, the construction is a little unconventional, so I would consider this an intermediate level pattern. But if you've been crocheting for a while, have knowledge of basic crochet stitches, and are familiar with the anatomy of a stitch, then I would definitely encourage you to give this a shot! The techniques involved are single crochet, single crocheting 2 and 3 stitches together, half double crochet, treble crochet, chaining and skipping stitches, working into chain spaces, and working in back and forth rows as well as in the round. If you're like me you're gonna want one of these babies in every color of the rainbow, so I suggest getting started ASAP!